Happy December! My life has been craaaazy lately so I’ve been backlogged on recipes but I’m back and sharing one of my absolute favorites today with these gluten + dairy free sausage balls. My sister makes a traditional form of these all the time around the holidays so I crave sausage balls in the winter but haven’t had them in years. A friend shared a recipe she found and they were so good but they needed a few tweaks so I hit the kitchen and made it happen. I love to make these on Sundays and quickly warm them up before I head out to the office. It makes a ton (24!) and comes together SO quickly that even your kiddos can help. I use a dairy free cheese, personally, and know the ingredients aren’t perfect but these are less about perfectionism and more about an old, comforting favorite. If you can’t find a dairy free cheese you like, you can totally leave it out and still enjoy these! As for the sausage, I love Mulay’s. Quality and sourcing matter so check ingredients for added sugar, soy, or preservatives. Preheat oven to 350 degrees and line cookie sheet with parchment paper. In large bowl, mix all ingredients and use your hands to incorporate very well until everything is combined. Roll into golf ball size balls and place on cookie sheet. Bake at 350 for 35-40 minutes or until fully cooked through. Store in airtight container in the fridge. Happy Halloween! It’s a typical Halloween here in Colorado: snowy and cold. It always seems that the weather fluctuates until October 31st, when it finally settles into cold temperatures. I love the magical winters but gosh, sometimes my skin does not. Bring on the moisturizer! My skin is incredibly finicky. It’s sensitive, acne-prone, and a combination of oily + dry. Seriously, I won the lottery of frustrating skin. When I was a teenager, it was SUCH a battle. I remember in sixth grade, right next to the water fountain by Mr. Ryan’s classroom, a bully made fun of my hormonal, broken out skin. I hid in the bathroom and cried during recess. When I was in high school, a boyfriend told me, while standing with this football buddies, that I looked like I was “sick and dying in a desert” without makeup. I never went without makeup to school again. In college, I would cancel plans or skip class so I wouldn’t have to show my skin. I thought that surely it would go away when I was an adult. I began to change my diet and noticed improvement but it still seemed so hit and miss. I figured this would be as good as it gets and I was stuck with this curse forever. Then about a year and a half ago I was on a girl’s vacation and just hit my whit’s end. I was so sick of dealing with this. So sick of ducking my face away when meeting new people. So sick of spending money on this or that, only to see no improvement. So sick of my skin dictating my life. So I decided to make my skin health a project. So it was time to change my skin. Since then, things have gotten so much better. The photo on the top was taken the day I returned from that vacation I mentioned above. My skin was dry, scabbed, uneven, inflamed, and oily and my makeup did nothing to help. The photo on the bottom was two days ago. Can you see the difference in my skin? Can you see the difference in my confidence? So if you’re wondering how I did it without spending hundreds of dollars on products, lemme tell ya! Diet: healthy skin begins from within. This was my first line of defense. Acne is almost always an external manifestation of internal dysfunction. It can be contributed to poor gut health, hormone imbalances (most notably, excess estrogen), adrenal dysfunction, or consuming foods you’re intolerant to. These things don’t always look like digestive upset; they can most definitely look like acne, chronic skin conditions, or dryness. The most common culprits for acne: gluten, dairy, nuts, eggs, and corn. So how do you know which ones affect YOUR skin? Remove a category for 30 days then reintroduce it and see how your skin reacts for the next week. Also take a look at your hormonal health. It’s also important to be proactive in supporting your skin health so include things like mineral rich bone broth, grass-fed collagen, filtered water, green tea, and leafy greens. What I did: I removed corn + dairy from my diet, added in collagen + a probiotic daily, and increased my water intake. 2. Products: what you put on your skin matters. I was so desperate to fix myself that I spent a ton of money on cleansing bars, masks, and balms, hoping for relief but they made my skin worse. I was so frustrated! What was wrong with me, I thought, because it seemed to work for everyone else! I shared my frustration with an esthetician and she said “DUH, look at those ingredients!”. Turns out, the products I was using were abrasive and comedogenic and were literally harming my skin far more than helping. The products I used worked for some but when you’re acne-prone, they were a no go! All of that to say, what works for some may not work for you. If you’re acne prone, skip abrasive products or ones that contain comedogenic ingredients like cocoa butter and coconut oil (the worst offenders!) and use gentle skincare products. What I did: I tossed my coconut oil + charcoal cleansing bar and opted for a super gentle cleanser (my faves are Mad Hippie + Acure’s Instantly Clear Cleansing Stick - both under $15! ), and added a gentle serum (I used KHUS+KHUS CBD serum or Mad Hippie’s Vitamin C serum). 3. Lifestyle: love the skin you’re in. Do you remember the college days where we would fall asleep in a full face of makeup and one glue-on eyelash hanging by a thread of glue? Sorry, ladies, we’re almost 30 now and need to kiss those days goodbye. It’s important to let our skin breathe. How we treat our skin goes beyond just what we do or don’t put on it but also how we nurture it. This looks like removing makeup EVERY night, saving up for an occasional facial, going makeup-free a couple days a week (take that, highschool boyfriend! ), or simply using a jade roller to massage your face every morning. These things aren’t only an act of love for your skin but also for your soul. When we actively reduce stress, our hormones will follow suit and then you have a win-win: taking care of your skin and taking care of yourself. What I did: I budget in quarterly facials, take steam baths right before I cleanse my skin, skip the makeup on days I’m just running errands, and wash my makeup brushes weekly (byeeeee, bacteria!). My skin definitely isn’t a dewey, angel kissed, airbrushed complexion but it’s SO much better than it used to be. Experiment with some of the things I’ve mentioned here and let me know how it works for you! Wishing you luck + success! HOW many steps!? I have to stand in my kitchen for HOW long? I’ll just make it up! And thus, these zucchini fritters were born by way of sheer laziness. HOWEVER. I’m sure glad about it because these little fritters are absolutely amazing. Let’s talk about them! They are: low carb, dairy free, gluten free, and grain free. They take about 5 minutes to prep and you can use them in lots of ways! Seriously, prep a batch or two of these at the beginning of the week and you instantly have a nourishing, veggie packed side to throw with any meal. Preheat oven to 400 degrees and line a cookie sheet with parchment paper. In medium bowl, shred zucchini using the large side of a cheese grater then use a paper towel or cheesecloth to strain excess liquid. Add in almond flour, eggs, sun dried tomatoes, salt, and pepper and mix well. Brush the parchment paper with half of the cooking oil of choice. Use a 1/3 c measuring cup to scoop the fritter mixture onto the parchment paper and flatten, rounding the edges. Brush the tops of the fritters with remaining cooking oil. Bake for 25-30 minutes or until tops are lightly golden. Flip and bake for 5 more minutes. Serve warm or store in airtight container in the fridge! It’s fall, y’all! Okay, it’s actually 80 degrees today but next week the high is in the mid-40s with snow forecasted but if that ain’t Colorado for ya, I don’t know what is. Few things kick off the season better than Broncos football, cool evenings, and green chili. This is a meal I grew up with and is a family tradition to make in mass amounts at the end of each farmer’s market season. You could say that green chili is part of my family’s legacy (#toofar?) so I take it really seriously so when the craving struck, I knew I needed an easy and quick way to make it. Hello, InstantPot! I just threw everything in, set it to cook, then ate approximately one million Siete chips while I waited. You can watch the step-by-step recipe on my “Recipes” highlight on Instagram or save this for later. Either way, you’ll love it! This is spicy. Heat runs through my blood, I cannot help it. If you want to mitigate the heat, use a mild green chili sauce and plain diced tomatoes. This feeds enough to cover your entire church potluck (remember those?) and then some so plan on having it for leftovers! Okay, let’s get to the recipe! Set InstantPot on low saute and cook onion and garlic in ghee until fragrant. Add in broth, tomatoes, green chili sauce, coconut milk, and chicken. Seal vent and set on high pressure for 12 minutes. Once it’s through the cycle, quick release pressure, remove chicken and shred, setting InstantPot to “Keep Warm”. In small bowl, whisk arrowroot starch and water to form a slurry. 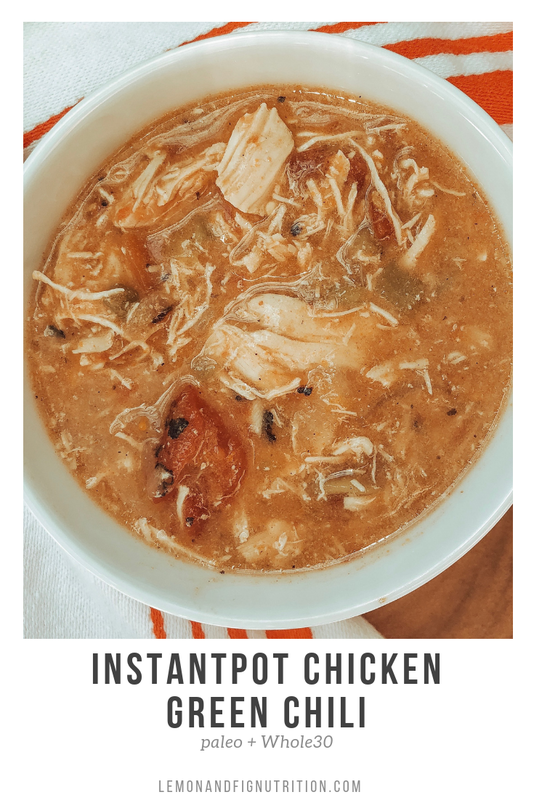 Add chicken back into the InstantPot along with arrowroot starch and spices and stir to combine. Allow to sit until slightly thickened and then serve! I hope you enjoy! If you make it, tag me on Instagram! I’d love to see!